Benefits of a First Look — Sweetchic Events, Inc.
2. They would only have that brief period of time during cocktail hour to take a) family portraits b) full bridal party shots, and c) most importantly, shots of the them together! One hour is just NOT enough for all of that! 4. The wedding is going to be at the gorgeous Chicago Botanic Gardens, so it would be an absolute crime if they didn’t take advantage of all the amazing photo-worthy locations! 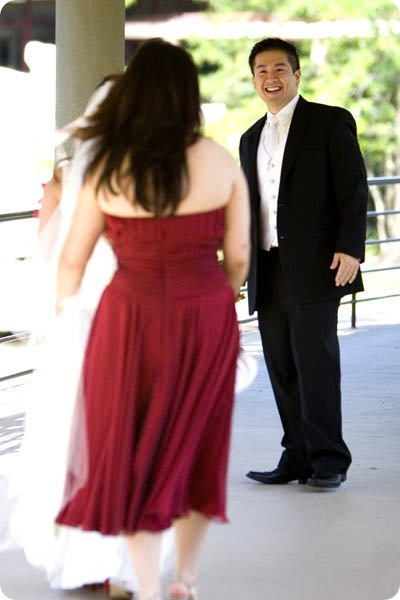 What they didn’t realize is that there is another option, aka the First Look… that private moment when the bride and groom see each other for the first time at a pre-designated location before the ceremony. In my opinion, this is just as special as that down-the-aisle moment because they actually have a chance to soak each other in (privately! ), get the ugly-cry face out of the way, take some time to chat and giggle over the anticipation and excitement of the day, all while the photographer is unobtrusively snapping away. Apparently, I was 15 minutes late, so here he is checking his watch. I love the big smile on his face! What did I tell you about the “ugly-cry face”?! Literally, HUNDREDS of pictures ensued after this, but I won’t subject you to them all! Are YOU doing a first look? Where are you doing yours? Don’t forget the tissues!